In a new TV spot for Double Stuf Oreos, tennis stars Venus and Serena Williams announce their decision to join the Double Stuf Racing League—"a fierce competition to see who's fastest to twist, lick and dunk their Oreo cookie!" 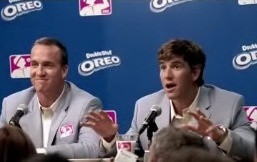 In the commercial, NFL brothers Eli and Peyton Manning rival the Williams sisters in their press conference--convinced that they are copycats! Here's the hilarious, cheeky transcript between the dueling sports siblings: Venus: "My sister and I are proud to announce that we've decided to chase the dream and become two-sport athletes." Serena: "We've joined the Double Stuf Racing League!" Peyton: "My brother and I like to announce that this is a great idea--when we thought of it, like a year ago." 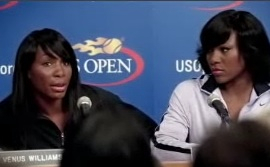 Serena: "Well my sister and I would like to announce that you guys are going down!" Eli: "My brother and I like to announce that Oooohhhh, we're scared!" Venus: "My sister and I would like to announce that you should be!" Peyton: "My brother and I like to announce that it's on like Donkey Kong!" Eli: "And stop copying us!"